Waiting for something to go wrong before fixing it might seem like the easy option, but letting a problem go unnoticed might only make it worse. If your springs come loose or your opener dies unexpectedly, things won't only become more expensive, they might become dangerous. Do yourself a favor and call a professional at least once a year to ensure that your garage door stays functional and doesn’t give you any nasty surprises. Our team will go over every component of your system and ensure that everything is working perfectly. Most openers have a pair of photoreceptive “eye” sensors to prevent the door from closing if there’s an obstruction in the path of the door. These sensors are delicate, and won’t function reliably if their lenses are cracked or dirty, or if they fall out of alignment. Periodic cleaning, electrical checkups, and realignments will ensure that your garage door never flies blind. 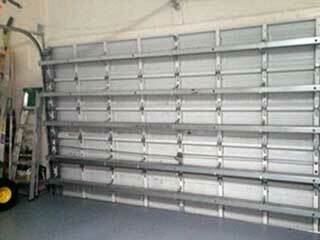 Your garage door is a complicated machine when it comes to storing and managing tension. The springs, cables, drums, and opener all need to keep each other in check and ensure that energy doesn't get released too quickly or unevenly. A full tension-adjustment session involves tightening the screws, aligning the springs, smoothing out the cables, and performing a piece-by-piece examination of your garage door mechanism. If there’s anything that needs ironing out, our expert technicians can be counted on to fix it. Each time your door opens and closes an immense amount of mechanical stress gets placed on the springs. Without care, they can loosen or rust to the point where they just can’t handle the pressure any more. With proper lubrication and occasional adjustment, your springs can be kept in good condition so they can continue to stretch and contract without damaging themselves or their housing. While greasing up your springs, our technicians can also see check that they’re properly aligned and intact. There are a number of things that can go wrong with your door if it goes too long without professional maintenance. You can prevent this with a simple call to our team at Garage Door Repair Danbury – get in touch today and we’ll have a team on the way as soon as we can.